This deck is mostly based on malimujo's 7-0 finish in a MTGO Legacy Challenge. I guess I got a bad case of beginner's luck! There were 4 teams, so we played against every team once, then the 2nd and 3rd played a semi-final game to decide which team would face the 1st team. 2-1 against Turbo-depths. First game, he Inquisitioned two Flickerwisp , and manages to copy his Dark Depths with Thespian's Stage . Luckily, I had drawn my third Flickerwisp with a vial on 3. I first target Marti Lage with Swords to Plowshares , and when he uses Crop Rotation to fetch his protection land, I vial-in Flickerwisp in response. He was at 4 and I had 3 attackers. Game 2 he won on turn 3, while my shields were down to play a Mirran Crusader . It was a risk I had to take to get a clock. Game 3 took a much longer time. I started with 5 lands and Battlerskull! Inquisition whiffed. :) I had Wasteland and Karakas in play most of the game, and he fell to a beatdown by a Mother of Runes with Umezawa's Jitte . He created a Marit Lage, but I made sure I was over 20 life with Jitte and Mother protected a Flickerwisp to bypass the token. 2-0 against burn. Game 1, turn 3 Batterskull . Game 2 was very, very close. 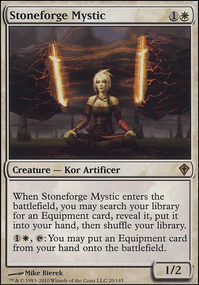 He got me down to 1, killing the first Stoneforge Mystic , but a couple of Swords to Plowshares saved me. He was down to 1 Mountain and I topdecked Sanctum Prelate . I had to chose between Prelate or Batterskull that turn, and I put Prelate on 1, which saved me (he drew Goblin Guide and Lightning Bolt ). 2-0 against Grixis Delver. Game 1 was over fast, end of turn 4 his shields were down, so I vialed-in a Mirran Crusader and equipped it with Sword of Fire and Ice , making it all but impossible to deal with. Game 2, he played Delver, Jitte, flipped delver, quipped jitte and swung. Luckily, I had a Swords to Plowshares . It was his only threat all game. Finished first, and the team we beat ion the first match won the semi-finals. 2-1 against Turbo-Depths. Game 1, I mulled to 5 and lost badly. Game 2, I keep a reasonable 6, though I don't remember the details exactly. We made several bad plays, but I won with Brightling hitting for 4-5 a turn. He had to spend 2 spells to remove it. While we were shuffling, my team won, so we played the last for fun. I remember I was over 30 life and had a Germ with Batterskull and Sword of Fire and Ice equipped at some point. Caw blade with out the caw.